In this area, it’s not just the taps that are empty of water. There are no rivers, lakes, streams or even any underground water sources. I’m told you can dig and dig, drill and drill, metres down, but you won’t find water. So where has my steaming bucket of clean water come from? 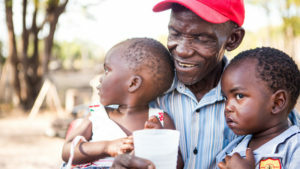 You may have heard about CAFOD’s Lent 2012 Appeal and Thirst for change campaign. You might even have been part of it – maybe donating to your parish collection, or going on a solidarity walk for water. What was remarkable about this Lent campaign was how thousands of you came together to say no, in today’s world it’s not right that people still live without water. £9.3 million was raised and a further £9.2 million was given by the UK government for water projects in 15 countries across Africa and Asia. So, the short answer is that my bucket of steaming water came from you. What is government match funding? 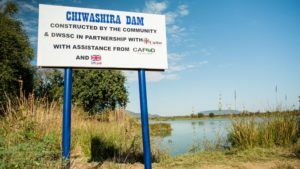 With some of the funds raised from the Lent 2012 Appeal, CAFOD were able to rebuild an old reservoir just outside Nembudzia that had been broken for 16 years. Local people helped out to construct a concrete dam and plant vegetation to build up the reservoir banks. When the rainy season came, the reservoir filled and people flocked to collect water. Paul was one of the first people to collect water from the new reservoir. He lives less than a mile away. 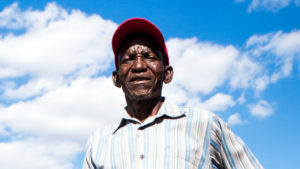 When I meet him at his home, he eagerly shows me around his entire farm, pointing out his vegetable plot and chicken coop, neither of which were so healthy or productive before the reservoir. “The nearest water source then was 14km away,” Paul explains to me. Knowing that I can walk a mile in just over 15 minutes, I do a rough calculation and work out that’s at least a two-hour walk. I see the empty yellow containers stacked in the shade of the house and wonder if I could even lift one of those full of water, let alone walk over eight miles carrying it. But even this water wasn’t clean and Paul’s children often fell ill with diarrhoea. Paul leans towards me and lowers his voice. “We didn’t have enough to wash ourselves. The children had diseases. They were dirty. It troubled me. But what alternative did we have? In 2014 the reservoir was completed, and three years on – even in the dry season – it still holds water. A further government match-funded project is currently being completed that will purify the water using ultraviolet light and pump it to village taps, so it doesn’t need to be filtered or boiled before drinking. Paul Hururapwe now has water from the nearby reservoir. “The people living in the area are special,” Paul confides in me. “We’re special because we live close to water. More than 30,000 people from nearby towns and villages are now using the water from the reservoir. They’re seeing significant changes in their local area. There’s been a huge impact on the health of the local people – not just because they now have a reliable supply of water for their homes, but because they’ve been able to use the water to grow vegetables. And now that water is available to make bricks, dozens of new houses have sprung up along the surrounding tracks that lead to the reservoir. It’s fast becoming a desirable area to live. It’s not surprising, given that across the world more than 40 per cent of people are living without enough water for their daily needs, and the United Nations anticipates that – with a growing population and the impact of climate change – this number will rise. 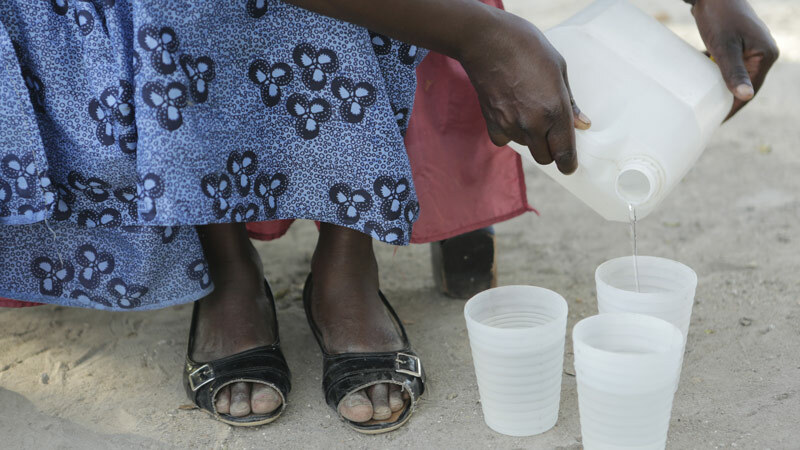 Your generosity brought drinking water to 400,000 people. Thank you.